CM: A 'silhouette' is a view of an object consisting of the outline and a dark interior against a light background. The term was coined after its originator Étienne de Silhouette (1709-1767) who applied it to pictorial representations cut from thin black card, and has been subsequently extended to describe the image of a person, object or scene. Silhouette profile portraiture is considered to be a traditional form of art. The advantage of the profile portrait is that, because it depends strongly upon the proportions and relationship of the bony structures of the face, forehead, nose and chin, the image is clear and simple, and deviates less from the appearance of the sitter with changes caused by age, weight and illness. In its capacity to give accurate information about gender and age from outline alone the silhouette is as unique and exclusive as the thumbprint. As a silhouette profile's interior is featureless, it has been used in art to describe the particular characteristics of the face's shape and the dress' style or period. As a matter of fact it is a fascinating challenge to identify the person in silhouette profile portraits of well-known people that are not named. Silhouette profiles were the cheapest way of recording a person's appearance. The invention of the camera in the first half of the 19th century signaled the end of the silhouette as a widespread form of portraiture. However, the skill was not lost, and travelling silhouette artists continued to exhibit their work at state fairs into the 20th century. The popularity of the silhouette portrait was reborn in a new generation of artists who appreciate them as a nostalgic way of capturing reality. In England there is an active society of silhouette artists, and Megakles owes his attraction to silhouettes to his English origin. Silhouette portraits may be created in any artistic media, and Megakles herewith applies digital technology to continue their tradition into the 21st century. Though the most famous silhouette artists of the past included subjects of the nobility and people who distinguished themselves in society, politics and economy, Megakles chooses subjects of people he gets to know from his immediate environment that relate to the visual arts and culture in general. Unlike traditional silhouette portrait artists, who would cut or draw the likeness of a person, freehand, within short time, Megakles uses his own photographs of people in profile, which he then processes by means of computer imaging technology. The Silhouette of Lafcadio Hearn is based on the archival photograph of 1900, when Lafcadio was a teacher of English literature at the Imperial University of Tokyo. As Lafcadio preferred to appear sideways to conceal his blind eye, this profile perfectly lends itself to the silhouette of black against a white background. 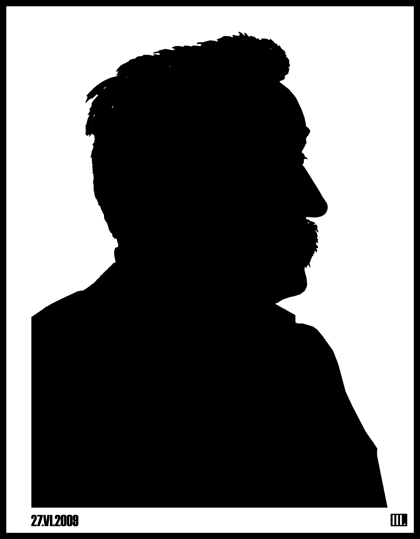 Megakles used the silhouette technique physiognomically to express Lafcadio's facial character - pointed chin, mouth veiled by a heavy moustache, slightly aquiline nose, bulging eye, bushy brows, and edgy hairstyle. Based on one of Lafcadio's last portraits, this silhouette brings out the culmination of his personality's dynamism.